The adage “You Can’t Have Your Cake And Eat It Too” dates back to Thomas Cromwell, the Duke of Norfolk in Sixteenth Century England, who originally said “a man can not have his cake and eat his cake.” It today represents the concept of having to choose one item above the other, along with the idea of trade-offs. It may also imply the cost and consideration of one opportunity against another. Hence, you may want to purchase luxury watches along the lines of Rolex, Omega and Cartier, but may not have the immediate cash-flow to do so. 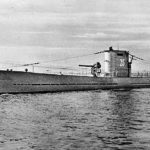 You could however finance one and pay for it over time and pay heavy interest fees. Or, you could choose to pay for one on layaway and enjoy your new watch once you’ve completed paying for it. 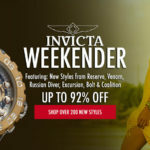 However, you could choose to shop our Have A Stress-Free Day With Interest-Free Payments Event at WorldofWatches.com, featuring the best names in luxury timepieces including Rolex, Oris, Maurice Lacroix, Omega, Longines, Movado, Raymond Weil, Cartier, Ebel, TechnoMarine, Bedat & Co., IceLink, Hamilton, Ritmo Mundo, TAG Heuer, Rado, Gucci, Versace & more. 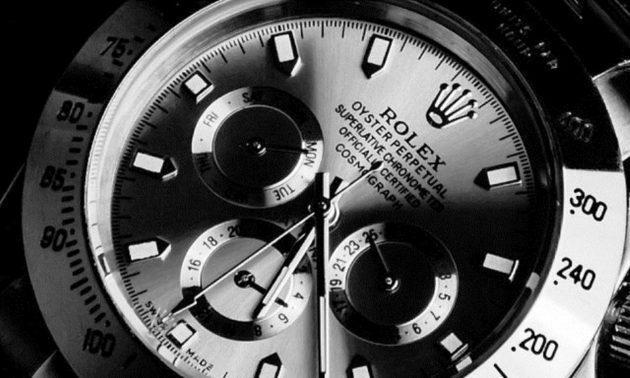 Each of the 90 or more prestigious timepieces featured in the event comes with three stress-free payments. The first payment is charged to your credit card at the outset of your transaction and your new watch will immediately be shipped to you. The subsequent payments will be charged to you credit card the following two consecutive months. 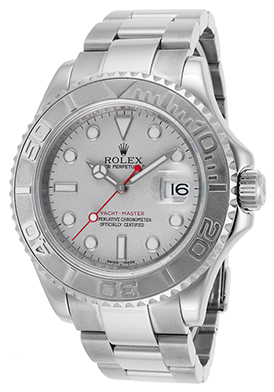 The Rolex Yacht-Master Automatic watch is an extraordinary choice for men. This prestigious men’s watch features the signature Rolex Oyster case in a blend of platinum and premium grade stainless steel with a highly polished mirror bright finish. The triple-link bracelet in brushed and polished premium grade stainless steel adds to the exceptional good looks. The bidirectional rotating bezel in brushed and polished platinum has raised markers and a U-notch outer rim. The textured silver colored dial shines with luminous pie-cutter hands, outlined luminous baton and cabochon dot hour markers. A magnified cyclops date window at the 3 o’clock hour reveals the automatic date window. 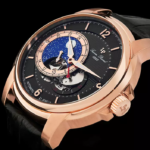 Features include a locking screw-down crown and case back for water-resistance to 100 meters or 330 feet, along with a scratch resistant crystal sapphire crystal above the dial. Rolex Yacht-Master Automatic men’s watch is 40mm in diameter, 12mm thick and has been awarded official Chronometer certification from the COSC (Official Swiss Chronometer Test Institute). The Bedat & Co. No. 8 Diamond Automatic watch is an absolute stand-out. This sensational women’s watch shines with luster and brilliance in premium grade stainless steel and diamonds. The generously oversized case in highly polished stainless steel is presented on the stylish multi-link bracelet in polished stainless steel with a convenient push-button clasp closure. A stunning array of shimmering round-cut diamonds are pave-set to glowing perfection on the lustrous bezel and adjoining crown cover. An exhibition skeleton case back lets you see the intricate Swiss-made automatic movement inside. 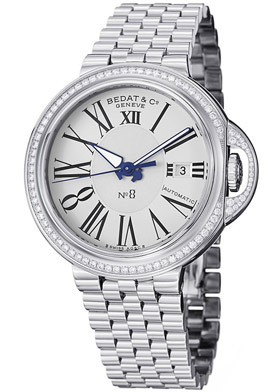 The classic silver-colored dial shines with outlined luminous sword hands and Roman numeral hour markers. A window at the 3 o’clock hour reveals the automatic date calendar. Features include a scratch resistant sapphire crystal above the dial and water-resistance to 50 meters or 165 feet. Bedat & Co. No. 8 Diamond Automatic watch is 42mm in diameter and 10mm thick. 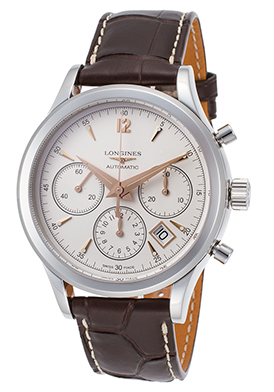 The Longines Heritage Automatic Chronograph is another exemplary selection for men. This classically elegant men’s timepiece is debonair and sophisticated with a perfectly round case in polished stainless steel, presented on a handsome brown alligator strap with contrasting white stitched detail. The stationary polished steel bezel encircles the silvery white dial with three sub-dials, rose gold tone sword hands and hour markers. Features include an automatic date calendar, small-second, 30-minute and 12-hour registers. An exhibition skeleton case back lets you view the Swiss-made automatic movement inside. Additional features include a scratch resistant sapphire crystal above the dial and water-resistance to 30 meters or 100 feet. Longines Heritage Automatic men’s chronograph is 41mm in diameter and 14mm thick. Ultra-sleek and sporty, the TAG Heuer Aquaracer watch is ideal for today’s active woman. The signature contoured case in brushed and polished stainless steel is presented on the attractive brushed steel bracelet with polished steel center link accents. The unidirectional rotating bezel with engraved markers surrounds the legible black dial with luminous baton hands and outlined luminous Arabic numeral hour markers. A window at the 3 o’clock hour reveals the automatic date calendar. Premium Swiss-made quartz movement inside assures you of precise time-keeping accuracy. 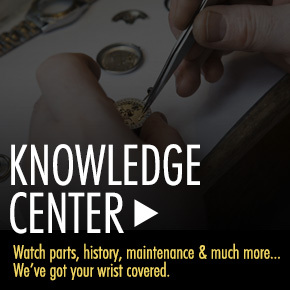 Features include a scratch resistant sapphire crystal above the dial, along with a locking screw-down crown and case back for water-resistance to 300 meters or 1,000 feet. 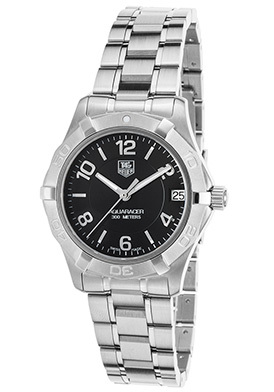 The TAG Heuer Aquaracer is women’s watch 32mm in diameter and 10mm thick. Huge Holiday Savings On The Best Name Brands: Up To 92% Off in July 4th Sale.